Grosvenor managed to come up with a couple of Jubilee gems in their November 29th sale, which unfortunately I got outbid on. Lot 214 was a complete pane of the Bechuanaland Protectorate overprint on the 4d. This is the third example I have seen so far (ignoring the different settings) and it sold for £500 plus commission. Lot 232 followed soon after; a complete pane of the British Levant 4pi on 10d which sold for £920 plus hammer and is the only example I have seen so far (so I should have probably bid more…). Elsewhere, David Feldman in their Jubilee auction on December 9th had a scarce Mafeking cover (lot 60136) with a pair of the 6d on 2d green & red Jubilees which sold for £1’300 plus 20% commission. 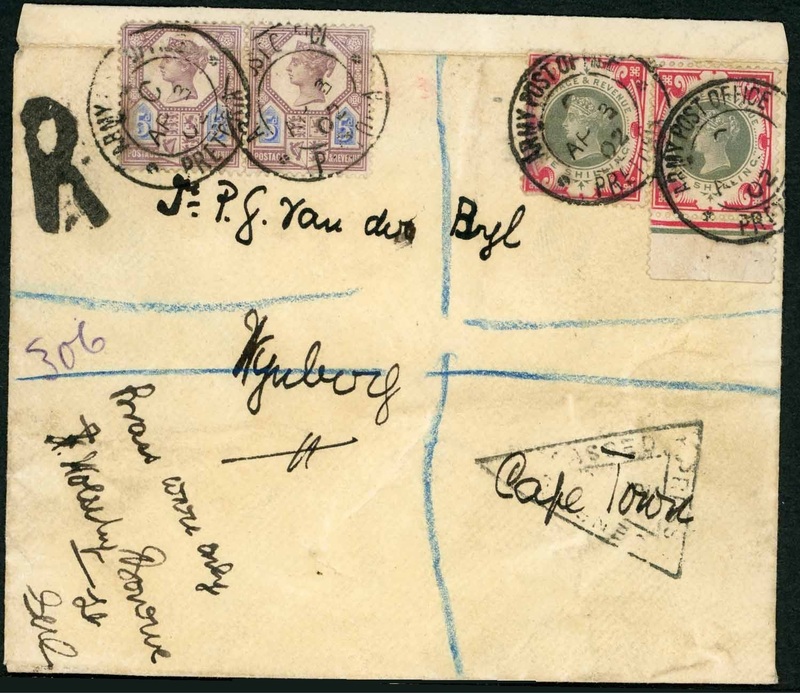 And lot 2126 in Cavendish’s December 6th auction was a group of Boer war covers which included a scarce 1s green & carmine franking with two examples along with a 5d pair on a cover (the 83rd cover I have recorded with a 1s green & carmine franking). It realised £480 plus commission. David Feldman’s December auction series included the Richard Pearmund collection of British Offices Abroad, which featured Jubilees used in Aden, Ascension, British Levant, Jamaica, Niger Coast and South Africa. 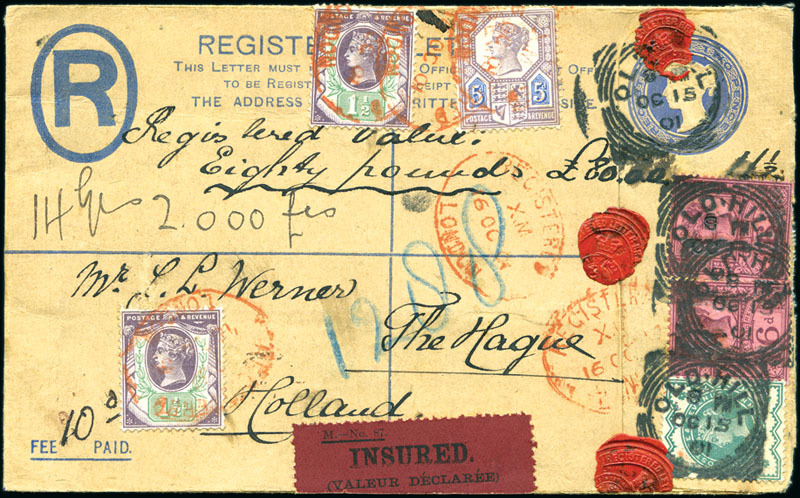 Not to mention two 1s green & carmine frankings (one was a new addition to the census and the other now has an image) in the GB section along with this beautiful Insured franking to the Netherlands (with sold for €228 incl. commission). 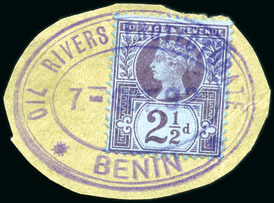 Niger Coast was a particularly strong section and included this possibly unique cancellation of Benin on a 2 1/2d on piece which sold for €840 incl. commission. 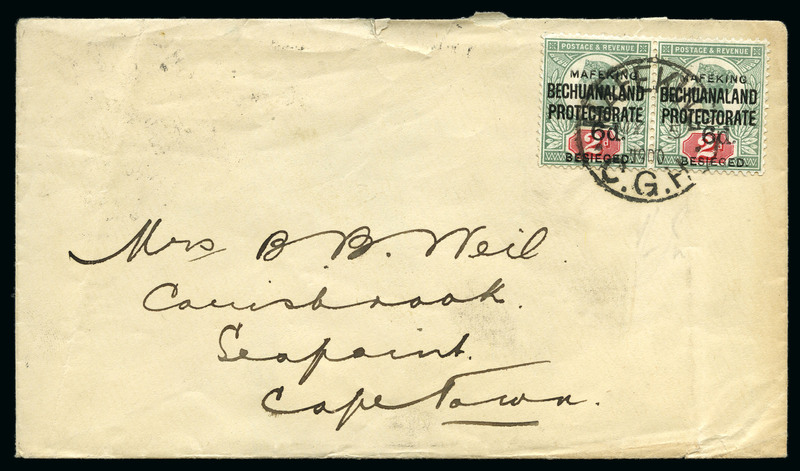 Also of note was a 2 1/2d on cover with a black Old Calabar oval ds in the same style. …and then four come along at once!! 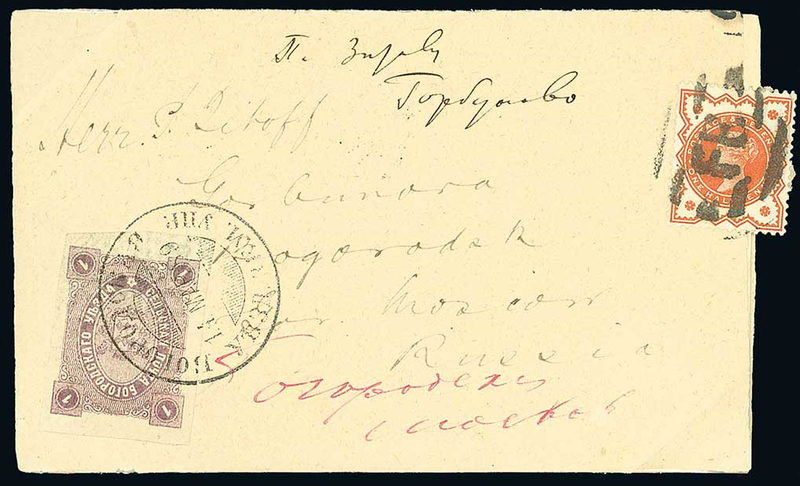 The cover shown is a rare mixed franking of a 1/2d vermilion and a Russian Zemstvo 1k violet imperf from Bogorodsk to pay the delivery or printed matter from the UK to Moscow, and then from Moscow to its final destination in the Bogorodsk distrcit. This is not the first Zemstvo and Jubilee combination cover I have seen. However the other two covers I spotted featured different Bogorodsk stamps. This brief tale begins in September, when David Feldman sold a near identical cover to this for €900. It continued yesterday in the USA, when Cherrystone sold another two near identical covers for $1’500 each! And now Cavendish have got in on the act, and are offering the example pictured with an estimate of £300 as part of the Seymour collection of newspaper wrappers in their December auction. It’s stated in the description that, aside from being one of Seymour’s favourite covers, that there are only three such covers known… So either the entire world supply has appeared on the market in the space of three months, or there are a few more than first thought. Either way, it’s still a very rare franking!